Another innovation from Kampa. 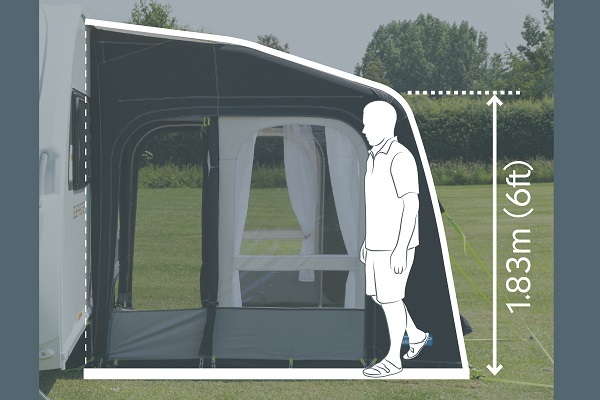 Awnings with Kampa’s Dual-Pitch Roof System have much better interior headroom, making Kampa awnings more spacious and useable than any other inflatable awning on the market. The taut Dual-Pitch roof line is also designed to perform. The pole structure of each roof has been carefully constructed to ensure that wind is deflected and rain water is shed efficiently, helping prevent puddling on the roof and thereby enhancing the performance. An ingenious way of attaching the rear wall of your awning to your caravan, most Kampa AIR awnings come Limpet™ Fix Ready. Simply attach the Limpet through the precut holes in the rear of the awning and fasten to a smooth caravan surface. There are four holes each side of the awning. Limpets come in a pack of eight. Extra holes, to suit your caravan, can be made using the Kampa Limpet Hole Punch. The effective lighting solution for your awning - An exciting accessory for your awning, the SabreLink™ lighting system ensures you’re never in the dark. The system allows you to link up to three lights together - that’s 450 LED’s. Each of our AirFrame awnings is SabreLink™ ready and can accept lights on the front AirPoles and also the centre poles. An Ace AIR Pro 400, for example, could have three lights along the front and another three in the centre. Each system is controlled using a remote control that allows you to switch the lights on and off and also dim and brighten them. In our poled awnings the lights can be hung from the horizontal poles using the ‘S’ hooks provided.